For years and years I adored glossy magazines. The gorgeous fashion, celeb news and beauty reviews were all something I looked forward too. I found nothing more exciting than waiting to get my hands on the latest edition and see what was in trend this month and the usual monthly columns until now. I just can't related to them any more. Who are those super skinny women in the clothing adverts? Have they not realised that the UK's average is now a 16 and there's nothing wrong with that? Do they not realise that £1000 for a coat is generally too much for the average Joe reading through on their lunch break or under the covers at night? Do they not realise that not everyone that reads their magazine wants another fad diet to loose 10lb in a week? Why can't we have real women? It's another reason I turned to blogging. I want to see real reviews, clothes on real women who haven't been photoshopped, loving the fashion that they wear. I don't care if they are a size 6 or a size 36 I want to read about what the fit is like, is it worth splashing the cash on? Is it true to size and is it still comfortable after 6 hours? Don't even get me started on the beauty reviews. 'OMG you have to try this new lipstick it's a bargain at £80.....' yeah, bargain. I'm all for higher end brands don't get me wrong, I love my Urban Decays and Estee Lauder's but who are these products actually aimed at? Plus I hate beauty reviews that just show the product packaging, no swatches? Fab I'll go out and purchase that red £80 lipstick, it might not suit me but it was in this months magazine and Kim Kardasian wears it so, ya know! I love keeping up to date with beauty trends but I also know what makeup suits my skin and my complexion so I hate articles that state that 'bronzer is out' or 'corals are in'. Okay they maybe the 'in' thing right now but there is nothing worse than wearing stuff that your not comfortable with or doesn't suit you because it's 'in trend'. I'm much rather real honest articles with options if orange based lipsticks don't suit you, here's a similar blue based. Be true to you, not everyone has to follow the crowd. Don't even get me started on adverts. I totally understand that running a magazine incurs mammoth expenses but really. 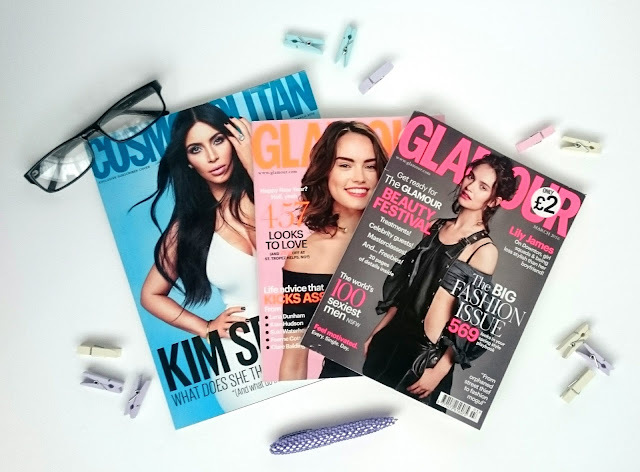 In Aprils Glamour magazine 155 pages out of the 268 paged mag were adverts. That isn't including the products actually advertising in articles, that it purely just full or double page adverts for everything from clothes, makeup and nappies to bags, shoes and shampoo. 155 pages. That means you have coughed up almost £4 for 113 pages of 'content' that still include product placement and adverts. Why is this okay? Now before you say it, yes us bloggers do advertise products, use affiliate links etc but the difference is you get a full, honest review. We generally get items to review, so although we get to keep the product we aren't paid to claim it's awesome. We write honest reviews about the good and the bad PLUS you can read our blogs for free. 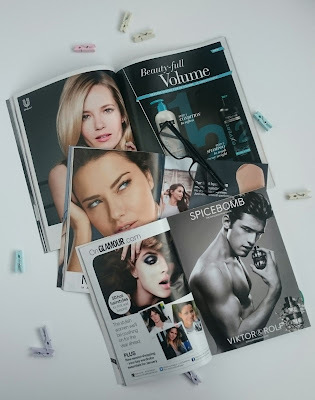 We won't charge you £4 every month and give you 155 articles of just adverts. Making money out of blogging isn't the reason 99% of us got into the game however none of us can lie, it's nice to earn a bit on the side as blogging is an expensive hobby. Domain hosting, blog hosting all adds up over the year and we have to get the money from somewhere! Lastly, they just don't seem relevant to me anymore. Maybe that's it. Maybe that's the whole reason in a nut shell but as a 27 year old mum to be with a husband and a mortgage, spending £549 on denim trouses from Chole or seeing articles that include bag straps for £300, just isn't up my street. It's not that I don't like to buy myself expensive treats but I'd much rather a Micheal Kors Handbag or a week away somewhere! Do you still buy glossy mags? I've never really enjoyed reading magazines like that, they really are just all adverts and like you said.. expensive! I think there's a massive gap in the market for a 'plus size' aka normal sized magazine. Where to buy and how to style etc!